Florals for spring are simply a classic. Since they come around every year, some might consider them almost cliché. Not me! Flowers are my thing – I never get tired of having a vase of fragrant stems on my table. …including a Hawaiian-style floral cigarette pant with black piping along the sides. Or another great example is this open-back maxi in a “winter floral”. Hey, why not? I love the way the wearer does not feel compelled to wear some special contraption in order to avoid her bra showing. 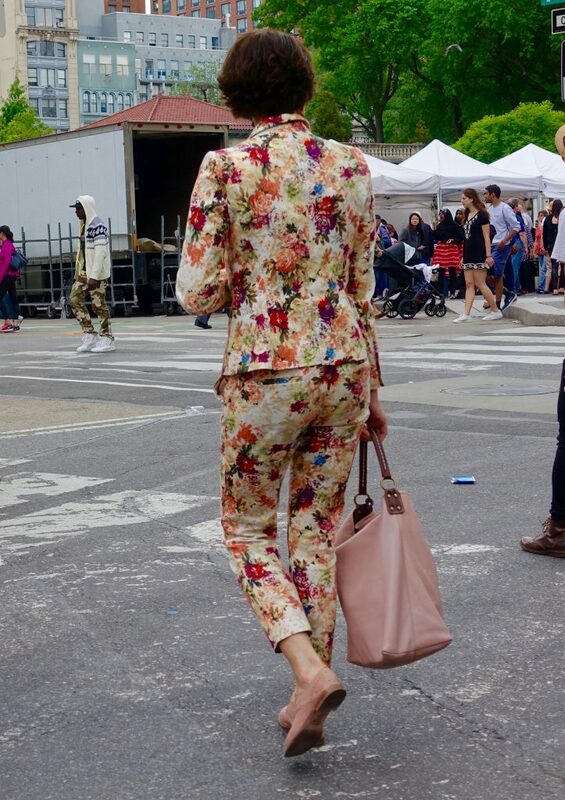 And how could I not be wowed by this gorgeous cropped spring/summer pants suit sported near Union Square on a Saturday – perhaps to visit the open market full of fresh flowers? Nothing boring about it! Thank you, David. I have noticed that in your street photography, you have also been capturing a lot of lovely florals!